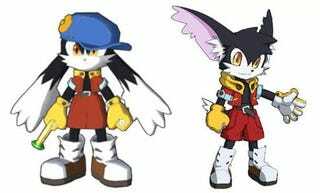 Namco Bandai may be updating the look of its mascot Klonoa in advance of a North American release of the awesome Wii-make Klonoa: Door to Phantomile. An online survey forwarded to us by a few readers suggests that Namco Bandai may be looking to transform the furry hero from floppy-eared whatever the hell he is to something more anthropomorphically identifiable, less bulbous and more cat-like... or is that bat-like? The survey asks that participants choose which version they prefer, the original, floppier Klonoa on the left or the more cover-friendly, more Poochie-fieid thing on the right. We're on the fence, largely because we'll take what we can get, but we're interested to hear your opinion. Thanks to Eric and AJ for the tip!